A beautiful mix of fresh mint, cilantro, jalapeno, shallots, garlic and ginger all blend in a food processor to a smooth paste. Then use this to marinate your chicken along with some turmeric, ground coriander, cumin, chili powder and salt. Let this lovely blend of flavors rest in your refrigerator to get to know each other for about an hour. Then heat your pan with some canola oil on medium and throw in a couple cardamom seeds, cloves and whole black peppercorn. Then add in the marinated chicken and pan fry until it’s nice and brown. Then add in some chicken stock and greek yogurt. Stir well and let simmer until the sauce thickens with a lovely vibrant green color. Sounds good? 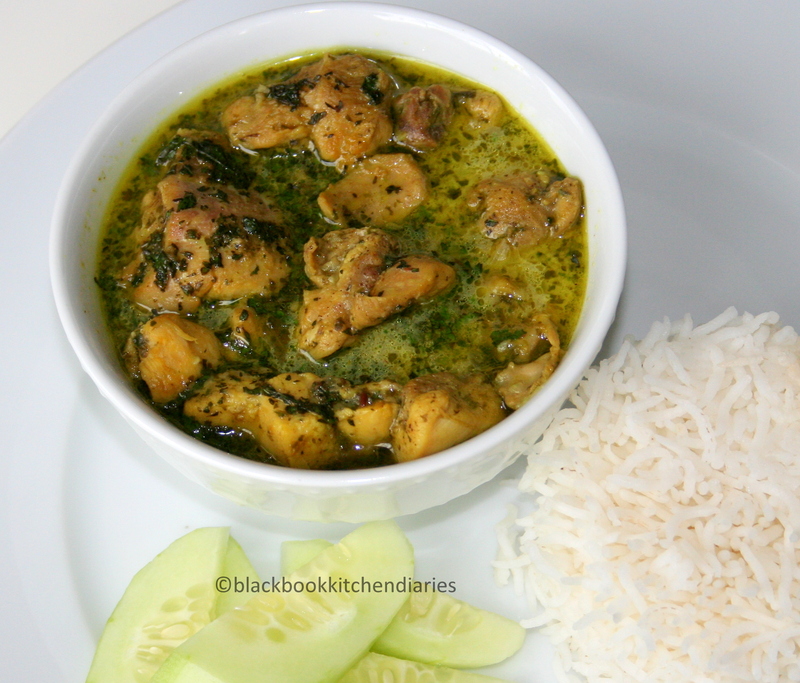 Serve this with basmati rice or warm naan bread or both. This dish is inspired by my husband who has a serious obsession with Indian food. He loves eating anything from biryani to naan to samosas. This all started way back during his college days when he used to hang out with his friends at their local Indian restaurant to get their fix. 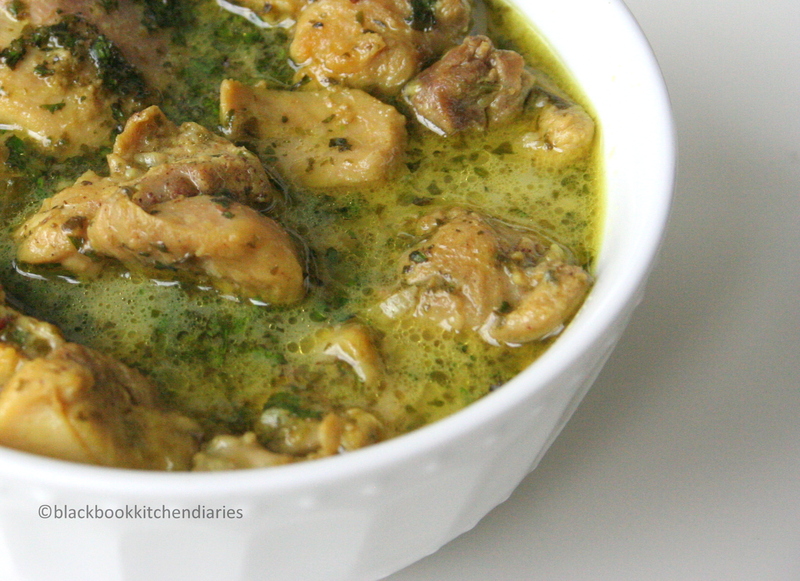 One of his favorite dishes is this particular green chicken curry. He would order it all the time. Now, I make this at home all the time. To me, the presence of the mint in here is very subtle not as strong as how I thought it would be, even though there is about a cup of it in here. I even tried making this with lamb and it turned out great. What a gorgeous, fresh curry! How many jalapenos did you use? I ask because I have recently been accused of trying to kill family members (though I thought it was just fine, thank you)! thanks sweetie:) i only use 1 medium jalapeno with the seeds removed. Green curry is calling my name! I have been dancing around making this dish for several weeks…(maybe it’s because of Aarti on Foodnetwork Star!!??) But now I’m gonna do it! This looks lovely. Great post and pics! I love curry, and this dish looks awesome! I wish my husband has an obsession on Indian food. thank you:) i like your post on the spice shop. i shall drop by the next time im in the city. Excellent super clean blog. This looks great and very different from the green curry that everyone is used to seeing in Thai restaurants. You had me at mint, cilantro and ginger.